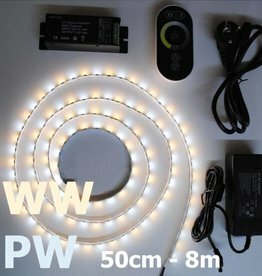 Plug&play complete LED Strip kits available in white, warm white, red, green, blue and yellow (amber). 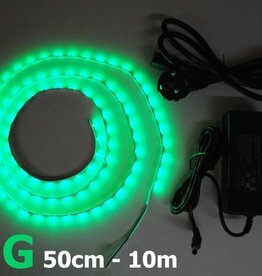 The LED strip sets consist of a suitable power supply and a LED strip in the chosen length. You can also add a dimmer, with or without remote and you can also choose between various other options such as control via WiFi or bluetooth. 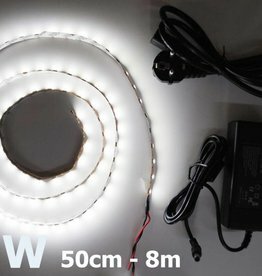 All LED strip sets on this page are plug&play and can be installed without any technical know-how. If you have questions about any of these products, please don't hesitate to contact us! 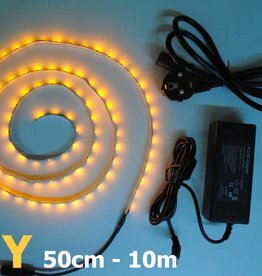 Adjustable color temperature: This LED strip contains both white and warm white LEDs. Using the included dimmer it is possible to adjust the color temperature from warm white to cool white. 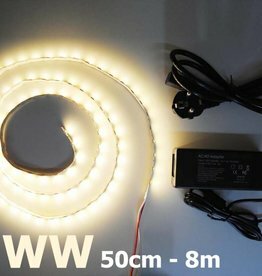 Order a complete and working LED Strip set - easy and quick. Use the dropdown menu to select the length. 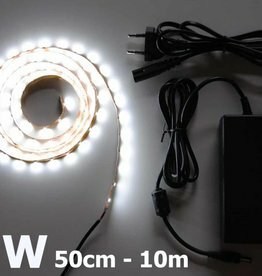 You will receive a LED strip in the chosen length, with connector and appropriate power supply. Dimmer optional. 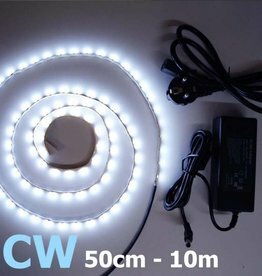 These LED strips can be installed without any prior knowledge. 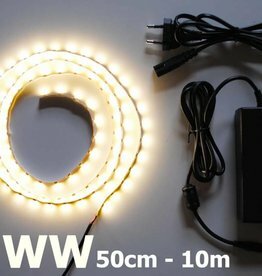 The LED strip can be cut to size every 5cm or 2.5cm, depending on the type. This can be done simply with a wire cutter or scissors. 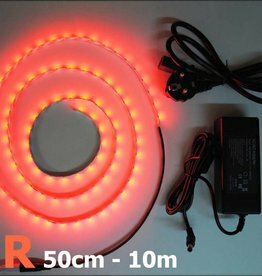 You can choose from a number of different ways to control the LED strips. 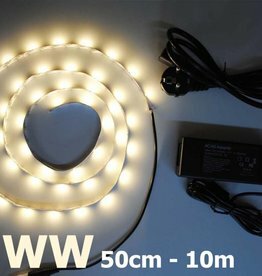 You can choose to work without a dimmer, which means that you simply receive a power supply and LED strip. 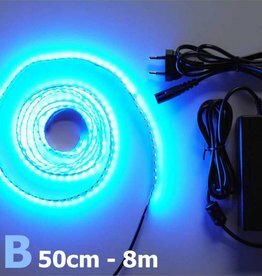 As soon as the power supply is plugged in, the LED strip will light up. You can of course use your own switch or operate it with your own 230V system. 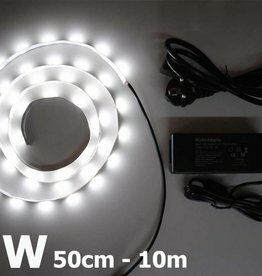 You can also use a LED strip dimmer without a remote control. These dimmers are cheap and handy if you only incidentally need to change the brightness of the LED strip. If you want more control over your LED strips, we recommend using a dimmer with remote control. Here too there is a lot of choice, see for example the product pages below. Lastly, there is the option to control the LED strip via an app. 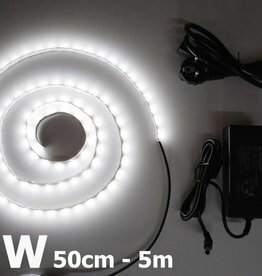 This option is very convenient if you have more LED strips in the house. We also offer support for various home automation systems, such as DALI, KNX, and Z-Wave. If you want to use these systems, you have to order the controller separately, see the main category "Accessories". If you have any questions, you can always contact us. 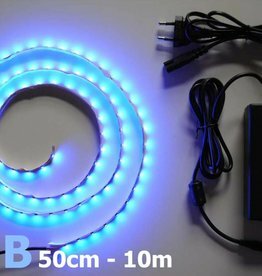 Single-colored LED strips are ideal for atmospheric indirect lighting. 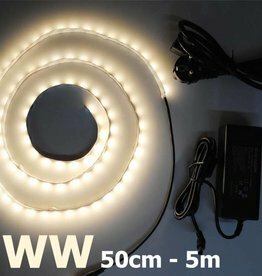 Especially with warm white LED strips, beautiful soothing lighting can be created. 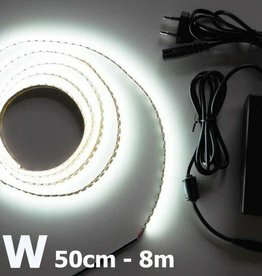 LED strips are very versatile in use and can be used in the most difficult places. A small niche or space between a bookshelf, for example? 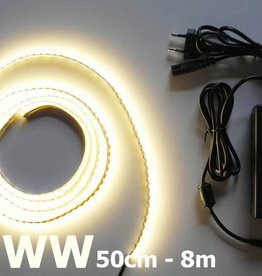 No problem with LED strips!